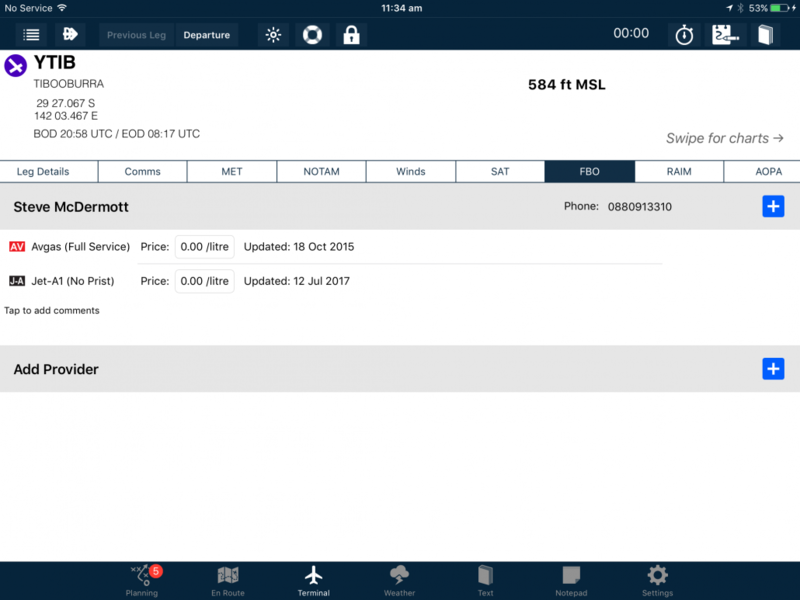 AvPlan EFB 7.4.3 is now available from the Apple App Store as a free update for all users. This release enhances the usefulness of the Fuel Price overlay (now renamed Fuel Availability) and addresses a number other enhancements. The Fuel Availability overlay now displays locations where fuel may be available but fuel prices are unknown. The grade of fuel (Avgas, Jet-A or MOGAS) is selected based on the fuel type in the current selected aircraft profile. The Fuel Availability overlay now provides a quick way of searching for an appropriate fuel stop, especially when flying range limited aircraft. Tap on the location and view the ERSA or AIP for latest information on fuel availability at that location. To add a fuel type for a location, tap the FBO tab under Terminal for that location. Enable the Fuel Availability overlay on the Enroute pane under Map Settings, View Items. Additionally we have improved the Waypoint display when you tap on a flight plan waypoint on the map. The buttons are now more obvious and we have increased the font size for the Communications and Plates at the location. We have also added the latitude and longitude for the location as well. We have improved the user waypoint editing display – the correct keyboard is displayed by default (with numbers) plus you can omit the hemisphere (‘N’,’S’,’E’,’W’) and the current hemisphere is assumed. The current entry will clear when tapped, but if you enter no information then the previous value will return. Fixed some layout issues on iPad in the new Settings pane.